The perfect natural way to keep pests under control. This carnivorous plant eats insects! The coloured "mouths" attract flies etc, as soon as the fly enters the "mouth" the jaws close trapping the fly. The plant then begins to digest the insect. The plant obtains all its nutritional requirements this way and will grow to suit the availability of victims! 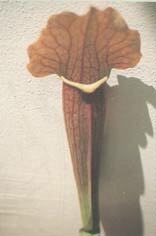 The pitcher plant, Sarracenia purpurea, has turned the tables on animals--eating them rather than being eaten. Pitcher plants are classified as carnivorous rather than insectivorous because they consume not only insects but also isopods, mites, spiders, and an occasional small frog. 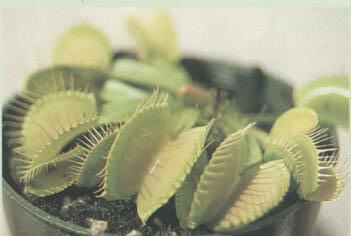 While carnivory helps the plants remain vigorous, grow larger, and produce more flowers, it does not appear essential for the survival of individual plants. This unusual life-style has evolved as a means of obtaining nutrients in places otherwise deficient in them. In addition to phosphorus and nitrogen, pitcher plants obtain Health and Nutrition Information and Products and other trace minerals from their prey.